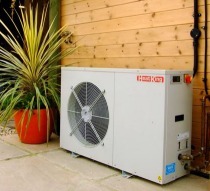 Air source heat pump works in the same way as a ground source heat pump, except that they take heat from the air rather than the ground and are considerably cheaper to install. COP means coefficient of performance. This indicates the heating provided by the unit related to the amount of electrical input required to generate it. Example: A heat pump claiming a COP of 4 to 1 means that for every unit of heat it provides you will only be using 1 unit of electricity. The British standard for testing air source heat pump is BS EN 14511. MCS is The Microgeneration Certification Scheme.